Our new comrade had played the game a lot more than we had, and he was gracious when we messed up, helped us when we were on the verge of death, and schemed with us for our next moves. We became friends. And as I revelled in our gaming friendship, another guy across the room bought pizza for everyone who was still at the lounge at midnight on a Saturday night. There were no jokes about noobs. There were no socially awkward remarks for my being the only woman in the place. There were no angry yells. And there was free pizza for all. 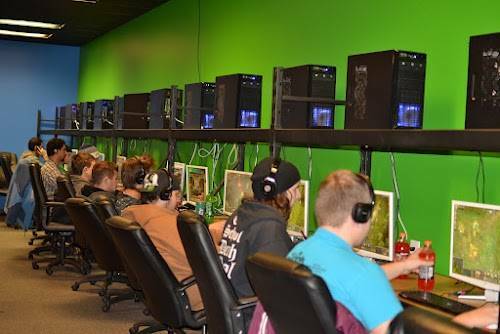 This is one pretty cool gaming lounge– a place for human connection, in addition to virtual connection. Call me sentimental. You can check out the gaming lounge we frequent here. It’s called Gamerz Funk. Don’t judge it by the name. Thanks for the kind words. I definitely also appreciate playing games solo at home. You’ll have to let me know if you do try out a gaming lounge near you.